Indian LED lights industry is undergoing dramatic changes, and is entering an exponential growth phase as more manufacturers jump in. Low price competition has led to a phenomenon that is coined "frugal engineering", where manufacturers are driven to engineer products at lower prices. Frugal engineering and innovation has driven Indian LED industry into an exponential growth phase. "Growth is happening practically by the day," said Deepak Loomba, Managing Director and CEO of De Core Nanosemiconductors. "I know a lot of my friends in the industry that were producing 200,000 lamps per month, and are now producing 400,000 lamps and are saying they are still short." Companies in India are now buying from their peers and rebranding the products as their own, he added. In fact, there is a LED supply shortage in India these days. However, this has not always been the case. India had been using LEDs for quite some time, but mostly in niche market applications, such as wall washers and later in inexpensive LED decorative lights, said Loomba. Then a period of imports from Chinese LED manufacturers followed. It was not until about 2008-2009 when LED lighting applications "started appearing in more sensible numbers", he added. Emergence of LED tube lights for retrofit projects appeared at around 2010, and at the time were mostly found in a small number pilot projects, said Loomba. Initially, LEDs were difficult to sell in India, and it was hard to convince consumers that LEDs had a long lifetime that could repay their investments. Usually, in countries with low purchase power, economics are always most important, said Loomba. 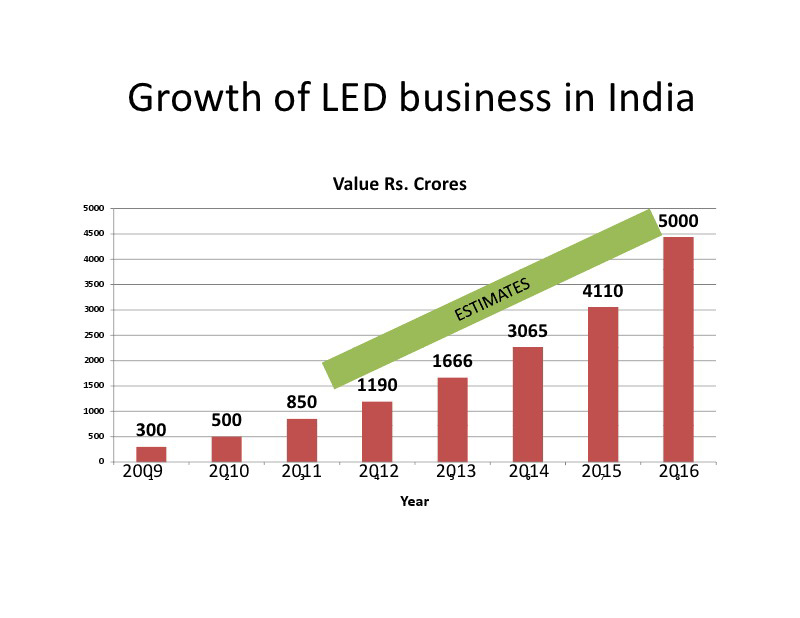 The LED sector in India remained small throughout 2011-2012, and the market value at the time approximated to $100 million or maybe even less. In addition, India does not have a semiconductor industry at all until today. As a result, the packaging industry has not prospered in the country, and it lacks semiconductor testing or piloting facilities. Although, the country does have a small SMPS and electronic manufacturing industry, the government did not prioritize the electronic industry for some time. "But this has changed in the last three years", said Loomba. One of the major drivers behind this change, was the large number of electronic products the country was importing. India is projected to import US $400 billion worth of electronics by 2019, which will exceed the country oil imports for the first time. Oil had traditionally been India top imported commodity, and it is one of the world top oil consumers ranking alongside China and U.S. This really made the Indian government rethink its electronic manufacturing strategy, and it began to initiate incentives to encourage LED and electronic manufacturing industry forward. Although, the lamp manufacturing industry was well established in India, it did not warm up to LEDs at first. Most of the lamp industry revenue was coming from CFL sales, so they did not warm up to the industry at first. "No one is going to like one of the major revenue components is going to decline," said Loomba. Yet, the change from CFL to LEDs has become inevitable in the Indian market. "For the last three quarters, continually CFL manufacturing, or I should say CFL sales, have been reducing in every consecutive quarter," said Loomba. It appears in India, people have finally accepted this change from CFL to LEDs.